If you are researching the best home gym equipment to buy, you want to know that you have the choice of the entire range of top productsout there. This page is a helpful resource and comparison of the all the top elliptical machines currently available. 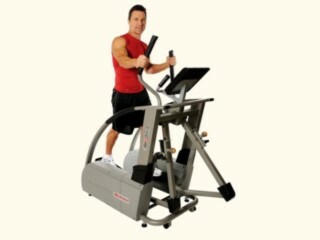 It is worth making a substantial initial investment in an elliptical machine. Sometimes called Cross-Trainers or Elliptical Trainers, these machines can be used for a whole variety of workout routines and are a valuable asset to any home gym setup. Many of the Elliptical machines in our list are commercial quality and you are likely to find them installed in a professional gym. In fact, these machines are so good, that's exacty why they made our Top 10 Elliptical Comparison list. A great Elliptical Trainer costs a lot less than a year's worth of expensive Gym subscription, so go ahead and get one to boost your home workout regime. Making a commitment to getting fit at home can save you 1,000's. Use our comparison table below to choose the best elliptical machine for your particular circumstance and read the shopping advice at the end of the page which will help you buy the right equipment for your home gym. A hugely competitive market, it’s easy to get lost in the variety of brands, models and additional features when it comes to elliptical machines. We review some of the best on the market for home and office use, as well as giving advice on things to look out for and consider before purchasing. The elliptical machine is the lower impact version of a treadmill, and is ideal for the elderly or for those suffering from injuries or joint pain. It is also a lot quieter than a treadmill and so is perfect for those who like to work out early in the morning or late at night. Whilst the majority of machines have wheels and are easily moved, non-commercial elliptical machines come with space saving options for the office or home, which are lighter, smaller and can be folded neatly away. You will also find options for rear, front or centre drive. Front drive machines are generally cheaper and focus more on the thighs, but the rear drive is easier on the lower back. Centre drives are relatively new but seem to offer the benefits of both front and rear. Sole designs bring commercial quality and a customised feel based all around comfort. Designed specifically to lower the impact against joints whilst maintaining high performance, this front drive machine has won numerous best buys. With a long 20” stride length that expands up to 22”, as well as an incline; you will definitely find a position that’s comfortable for you if your looking to train for a long period of time. A heavy flywheel gives you a silent and sturdy ride along with electromagnetic breaks that are top of the range, low maintenance and very efficient. The WhisperStride technology gives you an extremely smooth ride allowing you to enjoy the media options on the screen uninterrupted through the iPhone connectivity port. Designed with orthopaedics and biomechanics in mind this machine is made to wrap around you as you move, so the only thing you need to work on is your fitness without having to worry about the machine. A good all round machine with effective preset workout programs, not as technologically advanced as most but if you looking for a reliable, high performance machine that's good value for money then this is your pick. 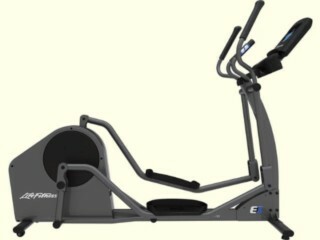 An entry level option that really has no competitors in its price range, this model could easily be in a commercial gym. With an easy step up height, an incredibly smooth motion the Octane gives a silent and comfortable ride. This machine is extremely durable and Octane Fitness have some great reviews on their servicing if you ever do have a problem. The width of this machine is just 26” which makes it very compact compared to some competitors, if your looking for affordable and space saving this is a great machine. The screen and interface are basic but they do have some workout booster add ons, for specific focus on arms, glutes or interval training. The Proform 12.0 NE lives up to its tag line ‘Everything you love in one place’. If you're looking for a well rounded machine that does it all, you really cant do much better. The 7” full colour display is so versatile you can watch your favourite TV series, surf Facebook or join iFit which will help you utilise the excellent display to run famous routes, cities and countries. Perfect for those who enjoy longer steady state workouts. Its very difficult to get bored on this machine and the minutes go extremely quickly as long as you have an iFit account. Its easy to assemble and can be ready within minutes of delivery, once the machine is ready its easily adjusted to your comfort and will save your user preferences for next time. With a very generous 24 levels of resistance, power adjustable stride and an excellent warranty the Proform is great value for money. LifeFitness is a widely known brand which has had years of innovation and research into developing fitness equipment. 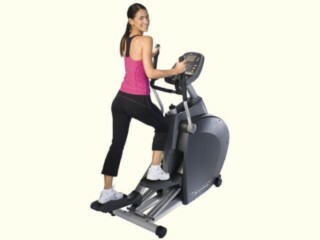 Their take on the elliptical machine combines excellent durability and comfort. Whisperstride technology otherwise known as DO NOT DISTURB technology is maintenance free and silent, giving a frictionless, undisturbed workout in your home environment. In addition energy savers lowers energy consumption by up to 90% when the machine is on but not in use. The Go console has 13 preset workout programs, 2 user profiles, an excellent 20 levels of resistance located on the handlebars for fast efficient changes, as well as some customisable options. LifeFitness have made this product with your biomechanics in mind, alongside the WhisperStride technology this is an extremely well put together machine backed by a good warranty. Its an entry level model that is designed to be easy to use and efficient whilst being extremely durable. Bringing the exact quality elliptical machine you use at the gym to your home. This fixed handlebar machine focuses your workout on your lower body, providing a low impact and smooth workout that optimises your results. CrossRamp Technology allows you to alter the height of the path your foot travels, which helps you focus on specific muscle groups like the glute to develop longer leaner muscles. The EFX833 has patented, low impact EFX motion which provides an experience that seems like your workout is easier than it is, even though your working at a higher intensity. The motion even allows your heels to remain in contact with the foot pedals, reducing the strain on your joints and refocusing the stress to your muscles. With 13 preset programs, 20 resistance levels and a large range of incline it provides a good variety of readouts for an entertaining and enjoyable workout. Silent and smooth are the words that best describe the E3i. It has an extra heavy flywheel alongside CoreBalance Technology that helps provide a comfortable and unique workout experience. CoreBalance is an innovative feature which uses pedal sensors to measure the force used from each leg, outlining possible imbalances that could lead to injury or a reduction in workout performance. So for those with previous injuries or lower back pain this will be a life saver for you! LifeSpan Club membership is an excellent added feature which stores all of your workout data and is compatible with the iPhone and android, but please be aware the bluetooth receiver for this model is not included. With a 7.5” display, two customisable user profiles and a generous 17 preset programs it offers excellent value for money on features. The warranty is strong as this is a high quality machine with durable parts, it also looks great! 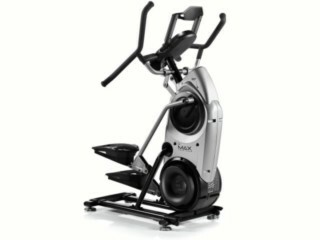 The M7 is the top of the range model from Bowflex. Designed to offer incredibly efficient workouts in a short time period as well as being zero impact and uniquely space saving compared to other ellipticals. It's unusual but comfortable movement pattern allows users of all abilities to have a vigorous workout with reduce stress across all joints. The movement pattern also makes this a perfect choice for small apartments or offices, as it's more upright than long. As a top of the range machine the M7 comes with a big price tag, but it is loaded with added features. It has a larger selection of resistance levels compared to of Max models, as well as a longer warranty. The smart features include wireless heart rate tracking and fitness app compatibility, this model also comes with 4 users profiles perfect for if you want the whole family to get involved. The M7 is a high quality machine, which is durable and built to last under the most frequent and vigorous use. If you're looking for the ultimate space saving elliptical, look no further than the Bowflex M7. It is only 46" long, 29.5" wide and 65" tall. A sleek and portable design, Kaiser as a brand is renowned for its high performance and is a favourite among athletes and performance centres. If you like short intense workouts then this is a must buy, there isn't much tech in terms of preset programs or fancy consoles because this elliptical is designed with one thing in mind… performance! Its compact size is also a huge bonus with the smallest base of any machine, it can be moved easily by its wheels. Although it has a lightweight flywheel its close to silent, even at the high ends of resistance which goes up to a huge 24 levels with a very classy smooth resistance shifter. The brakes are magnetic which make no noise and need no maintenance. Its self generating for power which means no plug sockets or increases in power bills, which also makes this one of the most portable machines available. A perfect machine for those looking for an elliptical with great durability and easy to clean surfaces suitable for regular use by the whole family. The console is easy to use, allowing you to quickly select features and monitor your workout data. This award winning machine offers 20 different levels of resistance, alongside a very smooth magnetic breaking system which helps get a low impact workout even at high intensities. The 1260EF offers a choice between stationary and moving handlebars so you can choose between total body or just lower body workouts. If you are looking to customise your workouts this machine has 3 advanced programs, the glute burner which focuses resistance onto the posterior part of your lower body, the quad builder which focuses resistance towards the front of the upper leg and the total trainer for an all round workout. An incline adjustment of 7-28% makes this one of the best ellipticals if you want to customise your workout comfort. 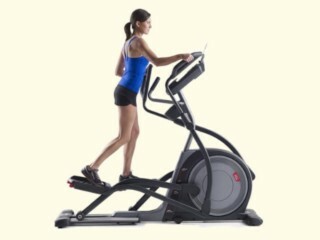 Patented centre drive technology gives this elliptical the edge in workout performance and biomechanics. With a more natural upright position you will have better control, balance and performance. So if you have injuries or feel your lower back whilst exercising it may be better to invest in a centre drive machine where it makes sure the force is balanced through your body. LifeCore have taken the comfort settings even further with a larger range adjustable stride from 17-25” catering for different height users, narrow spacing of the pedals help the hip joint and comfort grips on the handles. A touch screen console allows you to use the 12 preset programs; which include specific workouts for the glutes and 20 levels of magnetic resistance. Magnetic resistance is maintenance free and very quiet. The CD550 is an extremely well made and surprisingly compact machine, with an excellent comprehensive warranty. A well known name in fitness especially when it comes to ellipticals. The power of the 546i is self generated so as you start to move the machine will power up, there are no plugs which means it can be easily moved and used in any room of the house without increasing your electric bill. Electronically adjustable ramps allow you to use an incline or adjust the ride to your comfort through CrossRamp technology. In addition the biomechanics, this machine is validated by Western Washington University Biomechanics Lab for users of all fitness levels and sizes, promising excellent stability and freedom of movement for all, the added touch of rotating foot pedals is a real bonus. The interface allows you to control and choose from 8 exercise programs and 20 levels of resistance. This is a commercial quality machine with an ok warranty that can easily handle all levels of fitness and weight of user. What Should I Consider When Choosing An Elliptical Trainer? This machine is for those who really want to challenge themselves, even athletes. 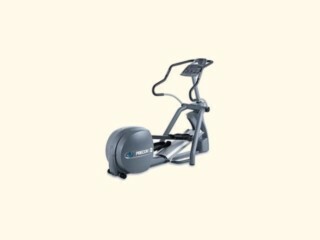 See Kaiser M5 Strider for a high performance elliptical. This machine is compact or has foldable elements. See LifeCore CD550 for a space saving design. Some machines are heavy and fixed others can be easily moved around by wheels. Some have padded foot pedals that move with the shape of your foot, there are also options for multiple hand positions and padded bars. See Sole Fitness E34 for a comfortable ride. Usually the durability of an item is seen by the warranty, also look for household brand names and commercial quality. See Pretor EFX833 for a durable machine. You may be exercising early in the morning, late at night or in the office. Look out for WhisperStride technology and a heavy flywheel. See LifeFitness E1 Go for a silent ride. All home equipment should obviously be aesthetically pleasing, but some have slightly more modern and sleek designs than others. See LifeSpan E3i For a good looking machine. Some people enjoy a basic machine that tells them time, speed and calories. Others are compatible with apps and smart phones as well as offering customizable experiences. See Preform 12.0 NE for a hi-tech machine. The warranty tells you a lot about the company and the machine. See Pretor EFX833 for an excellent warranty. What Features Are Available On Elliptical Machines? 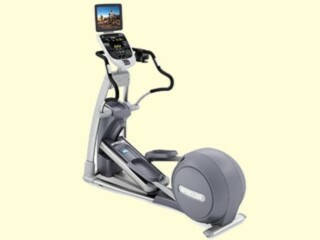 Generally we would advise you to avoid basic options of ellipticals; these are generally sold at around the $500 mark. They are unreliable for regular use and more often than not come with a poor warranty. 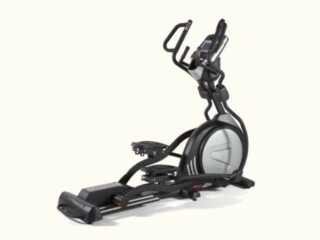 The more durable ellipticals also offer a range of additional entertainment features such as iPhone/iPad compatibility, web browsing, built in fans, touchscreen technology, TV, speakers and pre-set training programs. As standard you should expect a reading rack, cup holder and accessories tray. Can I Customize My Workout Experience? If you want a more comfortable or challenging experience look for an elliptical with customizable features such as pre-set programs with automatic adjustment, resistance and incline. This is also ideal if the machine is going to be used by multiple people as you will be able to adjust the stride length and foot pedals. What Are The Space Saving Options? 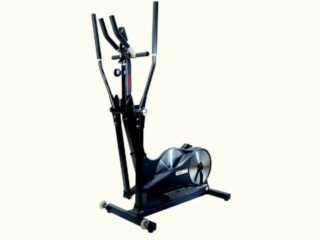 With elliptical machines you have two options for space saving. Some are simply designed to be more compact and come with wheels; others come with hydraulic or electronic assist to fold the machine in half to be stored conveniently. Saving space can be important for the home-gym environment so if you do need the size specifications then we have incuded everything that you will need to measure out the space in the Elliptical Machine Comparison Table. Are Elliptical Machines Quieter Than Treadmills? Elliptical machines are generally a lot quieter than treadmills. If sound is an issue for you, opt for machinery with a flywheel of around 17lbs or more. The heavier the flywheel the quieter and smoother the ride will be. Some Elliptical's do not have a flywheel weight specification because the manufacturers don't provide them. Some of these Brands say that it's not possible to compare machines that use different drive systems therefore the flywheel weight is irrelevant. In any case, in the elliptical comparison table we list both the drive system and the flywheel weight where available. It used to be the case that noncommercial gym equipment was a lot less reliable and sturdy than commercial equipment, especially the compact or foldable options. But these days the space saving options found in the mid-high price range are just as reliable as the ones in the gym. Lifetime warranties on the frame often come as standard now, and we recommend looking for 3 to 5 years on parts and labour. The elliptical machine has maintained its presence in gyms for a couple reasons. With everyone wanting to embrace healthy living, it is very likely that you will learn to love the elliptical machine because it's easy on your joints while offering total body conditioning. Here. we provide some ideal elliptical machine workouts for different levels of training as suited to your level. There are things you need to know if it’s your first time working out on one of these machines. First of all, training is not easy, but is very healthy way of losing weight and enhancing endurance. At the beginner level, you will face a number of challenges that seasoned fitness individuals don’t face. Research shows that more than half of people who enroll into fitness programs tend to pull out after just 3 months. If you are going to lose pounds significantly and achieve set goals, then being prepared to persevere is a wise idea. You will need to stick to the basic fitness programs and ensure that workouts are scheduled and adhered to as strictly as possible. Consistently hitting the Elliptical Machine is a very difficult thing to deal with mentally and that is why we advise you to set motivational goals that will keep your eyes on the prize. An ideal workout session should have the right mix of exercises to condition all body muscles while improving cardio performance. Keep track of your achievements and get support from friends to prevent cases where you are tempted to opt out. Understanding these basic requirements will set you on the right track towards success and achievement of training goals. There are lots of elliptical machine workouts to try out while at the beginners’ level. However, you will need to first learn how the machine operates. Each of our recommended Elliptical's comes with a comprehensive operating manual that will help you out. If you just bought a home machine, then consider seeking help from the Youtube vidoe's or even friends on how different features work here. Most elliptical machines come with pre-programmed workouts for beginners that only need a push button to get going. Remeber to warm up and down, before and after your training session. Most Ellipticals have programs such as Interval or Hill that ensure you have a little time for warm-up and cool down during sessions. Having preset features, the machine then adjusts itself to different resistance levels as your work throughout the session. You will find that many elliptical machines have an adjustable stride length which offers workouts such as Power Walk and Dual Direction. These will automatically change the stride size giving a variety of feel and resistance while training. An ideal interactive heart-rate elliptical machine workout ensures that you keep a desired amount of cardio training through various set beginner levels on the machine. It can also become the start of giving yourself some targets that will see you achieve certain results within a given time-frame. It may even be good to try out the Cross Circuit which is a workout session that features a combination of cardio intervals together with the machines strength exercises. This will allow you to choose the desired duration after which preset settings guide you through the sessions. The whole point of embracing beginner’s elliptical machine workouts is to condition your body for more intermediate exercises. It's always beneficial to push your body to achieve certain fitness goals. If you are to achieve that nice looking body shape, then exercises at the beginner’s levels won’t help you that much. They are important to prepare you for the intermediate step. The intermediate elliptical machine workouts are meant for people who already understand how the machine work and can thus combine a few tricks here and there to come up with proper training schedules to significntly improve your fitness levels. You need to prepare by doing some warm up first before diving deep into the intense fat burning zone. When in for an intermediate elliptical machine workout, it is always to priority to know what types of exercise you want and for what reason. You will find many fitness experts have designed programs for this level and I will help you cut throught the confusion and choose a great program by publishing some of my own favorites on this site. Exercises include the 'cellulite eliminator for weight loss' exercise, which uses intervals of 40 minutes. You start with 5 minutes of warm up after which the resistance levels increase giving your body the best performance level to rid body fat for about 30 minutes. You then have a 10 minutes recovery period as the cycle continues as much as you have time for! Advanced is the level at which you see most sporting bodies keep in shape while at the same time improving cardio endurance. They are basically exercises on the elliptical machine that ultimately push your body to the extremes. A beginner should never try this intensive exercises as it may end up being dangerous to your heart, doing more damage than the intended good. Specifically, the advanced levels seek to give you better workout results as compared to the intermediate level. You will find many of these programs ranging between 10 to 20 minutes of hard training. Ideally, your normal speed at this level should feel like a casual run though the park with very intensive resistance. It should feel like an average of 80% of your maximum effort with your lowest being 50% of your effort. That is where it should range even when recovering. An ideal advanced exercise will feature a 20 minutes session. The first two minutes are for warming up where the resistance level should be at 50% of your maximum effort. Speed and intensity should feature for the next 3 minutes hitting 80% effort after which you let it go back to 50% of your energy while recovering. The cycle continues for 20 minutes. Finally, the elliptical machine workout is a great opportunity to get into shape and burn that fat. Remeber, if it’s your first time on an Elliptical in your home gym, be careful to start slow at the beginner level before diving deep in the exercises. You can be sure of excellent results with an optimized elliptical machine workout. An Elliptical trainer is one of the best home gym equipment purchases you can buy. Go for it and have fun! Is The LifeSpan E3i Cross-Trainer The Quietest Elliptical Machine? Bowflex Max Trainer M7 Cardio Review : Is This Elliptical Worth It? Is The Precor EFX 833 The Best Gym Quality Elliptical For Home?